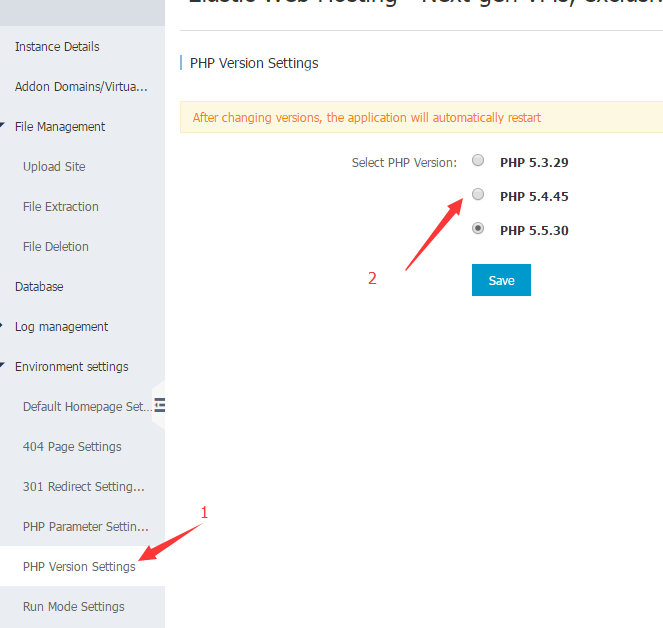 Web Hosting supports PHP and uses PHP 5.3 by default. If the default PHP version is different from what is required by your program, you can change the PHP version. Note: After the PHP version is switched, the instance automatically restarts. On the Host List page, find the Web Hosting instance for which you want to change the PHP version and click Manage. Click Environment Settings > PHP Version Settings. Select the required PHP version and click Save. You can then visit your website to test if the change is successful. If any problem occurs, modify the program or switch the PHP to another version.